It takes only one bad cop to destroy the reputation of an entire police department. In this case, three cops apparently conspired to plant drugs in a Baltimore drug arrest case. This is not exactly “protecting and serving.” If this is what it appears to be, I will not set foot in Baltimore ever again. Cops have a tough job. This video just made it tougher. Apparently, the officer planting the drugs didn’t realize that his body cam, which he turned on to record his finding of the drugs, actually records 30 seconds prior to his activating the camera, the period during which he planted the drugs. The Baltimore Police Department has suspended an officer and two others have been placed on administrative duty after the public defender’s office released a video Wednesday of what appears to be a Baltimore police officer planting evidence at the scene of a drug bust, as reported by The Blaze. According to the Maryland Public Defender’s Office, the roughly 90-second video was recorded on Officer Richard Pinheiro’s body camera on Jan. 24 and shows him planting a plastic bag in a can and hiding it under trash and debris as the other officers stand by and watch before they walk back to the sidewalk. A few moments later, after Pinheiro activates the body camera and audio is recorded, the officers can be seen walking back over to the location as the officer who planted the plastic bag picks it back up and pretends to “find” it. “I’m going to check here. Hold on,” Pinheiro can be heard saying on the video as the officers laugh. 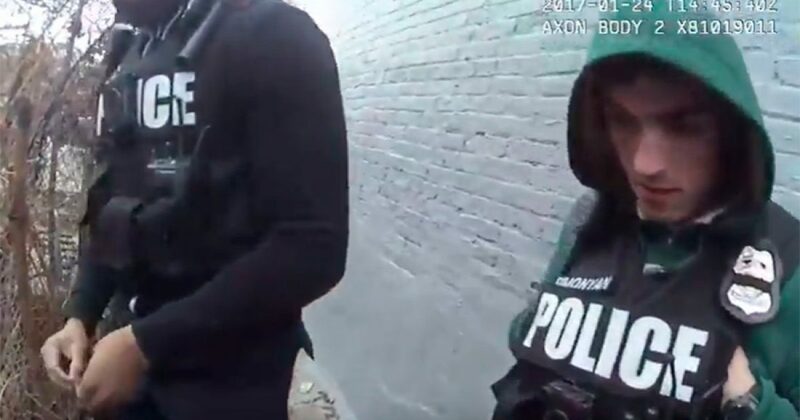 The body cameras, manufactured by Axon, are designed to record 30 seconds of “buffer” video before the cameras are activated, in the event that there is crucial evidence that takes place before an officer actually presses the button. The state attorney’s office said in a statement that they dropped the charges against the drug suspect after an assistant public defender who represented the man forwarded them the video last week. The suspect had been held in jail since January because he could not afford the $50,000 bail, according to the Baltimore Sun. Pinheiro was suspended, while the other officers in the video were placed on administrative duty pending the results of the investigation. The Baltimore Public Defender’s Office reported that it turned the video over to the Baltimore City State’s Attorney’s Office, the agency that handles prosecution of those charged with crimes in the city. According to CNN, Baltimore has paid out more than $13 million to settle lawsuits alleging police misconduct since 2011.